Check Price On Amazon This limited ingredient diet dog food is good for puppies with allergies since ingredients are limited and allergens can quickly be ruled out. However, this dog food will not solve all kinds of allergies. Therefore, if your puppy has allergies, it’s essential you consult your vet. Your vet may even recommend this dog food. As mentioned before, your puppy needs amino acids from proteins. A variety of protein sources means that your puppy will get a complete set of amino acids. Unfortunately, this formula will provide your puppy with less variation in essential amino acids. But there is hope as the ingredients derived from plants like pea protein could provide variety. Thankfully, the main ingredient is lamb which doesn’t cause allergies that much. While the main component doesn’t cause allergies, some other ingredients in this formula can create them. See, one of the major components is dried brewers yeast and brewers yeast is one of the common allergy triggers in dogs. In this formula, rice is an excellent carbohydrate source. By being a limited type of carbohydrate, it means your puppy will be less likely exposed to allergens. But it’s still possible for your dog to develop allergies through this diet. This dog food simply makes it easier to rule out the allergen. See, rice can cause allergies also, but it isn’t a significant cause. This dog food contains the ingredients like rosemary extract, green tea extract, and spearmint extract. These ingredients may have a beneficial effect on your dog as they’re known to have medicinal effects. Although in large quantities, these extract can hurt your puppy. But since these ingredients are present in a small amount, they’ll most likely be harmless. Check Price On Amazon To help your puppy Yorkie to maintain its good health, you may need a specialized diet for his age. This dog food represents what your puppy Yorkshire terrier needs. Even though this dog food is a great product, there’s some concern about its use of low-quality ingredients such as chicken by-product meal among others. Ingredients such as this would not provide your puppy with the needed amino acids. However, other protein sources in this food produce amino acids, but they’re not varied. In this dog food, fats and fatty acids are sourced from a lot of ingredients especially chicken fat, fish oil and vegetable oil. These fatty acids are sufficient for your puppy’s growth. This dog food also contains plant ingredients such as brewers rice, corn, dried plain beet pulp (source of fiber to help in digestion), brown rice, wheat gluten, and grain distillers dried yeast. The fiber in these ingredients will help your puppy digest its food. Plus, they’ll help prevent your puppy from being constipated. Unlike adult Yorkies, you may need to help your puppy Yorkie to learn how to eat dry food. This dog food is designed to encourage your puppy to chew as the kibble is designed for your puppy to grasp. To help maintain healthy skin and a beautiful coat, fatty acids Omega-3/Omega-6 and biotin are in this dog food. You’re probably already familiar with the wonders Omega-3 and Omega-6 can provide your dog’s skin. Along the same lines, biotin is known to have a beneficial effect on dogs which have skin and coat problems. If it already has a healthy skin and beautiful coat, Your puppy may not need biotin. Therefore, this component is an excellent addition but not essential. The prebiotic fructooligosaccharides will help in maintaining a healthy digestive system. Pre-biotics are essential in keeping good bacteria in your puppy’s digestive system. Check Price On Amazon Your large breed puppy needs the right amount of nutrients so that it will grow well. If you feed your large breed puppy with adult dog food, it won’t get the nutrients it needs and would not grow up well. Thankfully, the Blue Life Protection Formula Dry Puppy Food by Blue Buffalo exists for this exact purpose: to make sure your puppy grows up the right way. Honestly, it’s one of the top-rated puppy foods in 2018. This dog food has good quality protein sources such as deboned chicken and chicken meal to ensure that your large breed puppy will get its essential amino acids for its growth. Also, it includes other protein sources such as peas and eggs. In combination, these protein sources will make sure your puppy get the amino acids it needs. Along with providing all the amino acids your puppy needs, this dog food has menhaden fish meal that offers eicosapentaenoic acid, docosahexaenoic acid, and arachidonic acid. These fatty acids will help your large breed puppy develop its eyes and brain better. Additionally, the fatty acids will ensure that your dog will have a beautiful coat and healthy skin. As you would expect from a top line product, this dog food has the right ratio of calcium and phosphorus so that your puppy will grow its bones properly. Plus, it has the right size of kibble for small mouths and will have a beneficial effect on your puppy’s teeth. If you want to feed your large breed puppy with a grain free diet, you can try Wellness CORE Natural Grain-Free Dry Dog Food. This dog food contains good quality protein sources such as chicken and turkey. These highly digestible protein sources will provide your dog with the needed amino acids better than other protein sources. However, these highly digestible ingredients are the most common cause of allergies. For the development of brain and eyes, your large breed puppy needs fatty acids. Due to this, This dog food contains salmon oil which is an excellent source of fatty acids. Also, these fatty acids will help your large breed puppy have healthy skin and a beautiful coat. As you probably know, probiotics are essential for ensuring your puppy has good digestion and a healthy gut. Due to this, this dog food contains dried lactobacillus plantarum fermentation product, dried enterococcus faecium fermentation product, dried Lactobacillus casei fermentation product, dried lactobacillus acidophilus fermentation product. These probiotics will help your large breed puppy to have balanced gut bacteria. Check Price On Amazon Some puppies like wet dog food better than dry dog food. If this is the case for your puppy, this food is one of the best-wet food options for your dog. In this dog food, the main ingredient is chicken which is a highly digestible protein source. Additionally, there is a variety of amino acids sources like liver, meat, salmon, and rice. All of these ingredients are great for your puppy’s health; however, chicken is sometimes known to cause allergies. Along with providing a wide variety of protein sources, this dog food contains an extraordinary amount of fatty acids thanks to ingredients such as salmon. With these fatty acids, your puppy’s brain and eyes will grow well. Plus, your puppy will have a healthy skin and coat because of these fatty acids. Furthermore, guar gum and carrageenan are in this dog food as gelling agents. You’ve probably read in a lot of blogs that these agents could be dangerous. However, scientific literature shows that these ingredients are harmless. See, your dog does not absorb carrageenan so it won’t have any direct effect on your dog’s body. In fact, guar gum and carrageenan are known to increase the digestibility of nutrients. Therefore, your dog will absorb all the nutrients in this dog food. Check Price On Amazon As a part of the Taste of the Wild brand, this dog food is made with natural ingredients. In fact, it’s the best natural dog food for your puppy. See, this dog food is both grain-free and has a natural feel/flavor that your puppy will enjoy. With buffalo being the primary protein source in this dog food, the protein sources are varied enough to provide your puppy with the right combination of essential amino acids. These protein sources are among the least common triggers of allergies. Therefore, this dog food is good for dogs that are allergic to chicken. As mentioned before, this dog food is grain free. Therefore, the carbohydrates in this dog food don’t come from grains. Instead, the carbohydrates your puppy needs for energy come from root crops such as sweet potatoes. These root crops are good providers of energy and are varied. With these root crops, your puppy will surely get the energy it needs from this dog food. Plus, this dog food contains natural fibers from real fiber sources and other fruits and vegetables. These fibers from this ingredients will make sure your puppy won’t be constipated and have good digestion. Also included in this dog food, are prebiotics and probiotics. The prebiotics in this dog food are dried lactobacillus acidophilus fermentation product, dried bifidobacterium animalis fermentation product, and dried lactobacillus reuteri fermentation product. This prebiotics will provide your puppy with the right type of good bacteria. To help the good bacteria grow, probiotics are also included in this dog food. The probiotics in this dog food are dried chicory root and yucca schidigera extract. Ideally, these probiotics will stimulate the growth of good bacteria. Check Price On Amazon This food is one of the top-rated economic choices for your puppy as well as being from a well-regarded dog food brand. In this dog food, the primary protein source is chicken which is highly digestible. However, the other protein sources are not as easily digestible as a chicken by-product. Furthermore, chicken is also the most common cause of allergies in dogs. Besides being an excellent source of protein, the grains in this dog food will provide your dog with energy and vitamins. After all, your puppy will need energy while growing and this dog food will surely offer it. Also, your puppy will have a good digestion thanks to the dried beet pulp in this dog food. Check Price On Amazon Honestly, this is the best dog food for your small breed puppy as it contains highly digestible ingredients that will help your puppy’s growth. This dog food will surely provide your dog with its needed amino acids. Also, the protein sources included are the most easily digestible proteins. See, the primary protein source is chicken which is a very digestible protein. Additionally, pork meal is one of the best protein sources available. While chicken is a common cause of allergies, pork is not. Therefore, they’re less likely to trigger an allergy. With this in mind, you can be sure your puppy will benefit from this dog food. As you would expect from any grain-based dog food, this dog food has the best source of carbohydrates with grains being the primary carbohydrate source. Besides giving your puppy the energy they need, these grains will provide your dog with highly digestible nutrients. Check Price On Amazon As you know, it’s essential that your large breed puppy grows well. Due to this, specially designed dog food for large breed puppies is what you should feed to your large breed puppy. In these products, the food is made to control the right amount of nutrients your dog consumes. If your large breed puppy eats this dog food on a regular basis, it won’t become overweight. In being one of the best dog foods available, this dog food contains highly digestible proteins. See, the main ingredient is chicken meal which is a known highly digestible protein. With chicken meal being the main ingredient, your large breed puppy will surely get the most amino acids with this food. Also, your large breed puppy will get amino acids from the grains that are in this dog food. On the downside, chicken meal is one of the common cause of allergies. So, make sure to watch your dog’s reaction to the food. Equally as important as having easily digestible proteins, the energy needs of your growing large breed puppy will be satisfied by nutrients from the whole grains in this dog food. See, this dog food includes whole grain wheat, whole grain oats, whole grain sorghum, and whole grain corn. Aside from satisfying the energy needs of your growing large breed puppy, these ingredients also contain fibers which are more comfortable to digest and won’t cause stomach problems. Check Price On Amazon If you prefer a grain-free diet for your dog, this dog food will be an excellent option for you. With its natural ingredients, this food that great for sensitive stomachs. As any excellent puppy food should have, this dog food contains highly digestible proteins. For example, the primary protein sources are deboned chicken and chicken meal. As mentioned before, chicken is an incredible source of protein, but it can cause allergies. Along with having great sources of protein, there is an amino acids source, peas, in this dog food. Additionally, potato protein and amino acids complexes are added to complete the amino acids your dog needs. 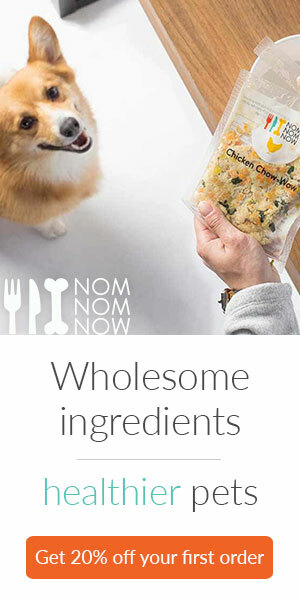 Therefore, your puppy will get all the amino acids it needs. Regarding the fat content in this dog food, it comes from different sources. Just like humans, fat provides your dog with a significant amount of energy. Also, fat will help in the transport of vitamins that will assist in the growth of your puppy. Furthermore, ingredients such as debone salmon and flaxseed oil provide fatty acids. These fatty acids will help in the growth of the brain and eyes of your puppy. The carbohydrate sourced in this dog food is mainly root crops such as potatoes and sweet potatoes. These carbohydrates sources will provide energy for the growth of your puppy. Also, fibers from the natural ingredients in this dog food will help in your puppy’s digestion. Check Price On Amazon This dog food contains nutrients necessary for your dog to grow and is readily available at most pet stores. Like many products in this article, this dog food contains proteins from several sources. The primary protein source is chicken which is a highly digestible protein source. Moreover, there are a good number of protein sources in this dog food. For example, corn gluten meal can provide a highly digestible protein, and poultry by-product meal has low digestibility. Also, this dog food includes animal-based tissues as an ingredient, and they’re processed which makes these tissues easy to digest. Plus, this ingredient is an excellent source of amino acids and flavor. To help in your dog’s development, this dog food also contains fats and fatty acids. The source of fatty acids in this dog food includes oils such as fish oil which is an excellent source of omega 3 and omega 6 fatty acids. These fatty acids will help in brain development and growth of the eyes. Check Price On Amazon This dog food contains natural ingredients which are very digestible and will provide the nutrients your puppy needs. Being a varied protein sourced dog food, it’s no surprise this dog food contains many sources of protein. One of these sources is the main ingredient, chicken, which is a highly digestible source of protein. Likewise, lamb meal is another source of animal-based protein in this dog food. However, lamb meal is not very easy to digest. Moreover, unlike chicken, which is the most common source of allergies, lamb is the least. Additionally, there are also several plant-based protein sources in this dog food, such as grains and legumes to help with digestion. One of these is peas which are an excellent source of highly digestible protein. As mentioned before, this dog food contains whole grains. These whole grains provide energy and fiber: energy is vital for the growth of the puppy, while, fiber is essential for digestion. Besides whole grains, this dog food has another source of fiber with the ingredient dried plain beet pulp. Also included in this dog food, are dried fruits and vegetables which are also a source of carbohydrates. Check Price On Amazon The first thing you should know about this dog food is that it has a high digestibility. Digestibility usually translates to how much nutrients your dog can get from the dog food. Therefore, you can be sure that your dog will get the most nutrients from this dog food. As you should expect from any top line dog food product, this dog food contains good quality protein. For example, the primary protein source in this dog food is a chicken meal which is a very digestible protein. Another quality source of protein is the menhaden fish meal, and grains such as rice also contribute to protein count, but not so much. All these natural sources of protein are very digestible. However, you should know chicken is a common cause of allergies. In this dog food, there are natural plant-based ingredients are present. Likewise, there are several sources of energy such as grains which provide carbohydrates. As you likely know, your growing puppy uses carbohydrates as energy. And you should feel confident that the sources of energy in this dog food are sufficient to provide enough for your puppy. Also, your dog will have a good digestion if you feed it with this dog food with fiber sources such as dried beet pulp and tomato pomace. Aside from helping in digestion and preventing constipation, fibers are easily digested and provide energy to your dog. The primary source of fish oil in this dog food is menhaden fish meal which is an excellent source of fatty acids. These fats help a lot in providing energy to your puppy. Also, fats help transport the vitamins in your growing puppy. Likewise, Flaxseed and sunflower oil are other sources of fatty acids found in this dog f. Sunflower oil is also a source of fatty acids in this dog food. Overall, fatty acids help in the development of the brain and eyes of your puppy. Furthermore, this dog food also contains prebiotics. The prebiotics in this dog food include yeast culture (saccharomyces cerevisiae), dried lactobacillus acidophilus fermentation product, dried enterococcus faecium fermentation product, dried aspergillus niger fermentation extract, dried trichoderma longibrachiatum fermentation extract, and dried bacillus subtilis fermentation extract. These prebiotics will provide good microbes to your protect puppy’s stomach. Also, this dog food has probiotics which stimulate the growth of good microbes in its gut. The probiotics in this dog food are yucca schidigera extract. Within this dog food, the main ingredient is chicken by-product meal that contains components that are not very digestible. However, an egg product is added as a natural source of highly digestible protein to alleviate this problem. After all, highly digestible protein is essential so that your puppy would get the amino acids it needs. Also, your puppy would get some amino acids from grain products in this dog food. One disadvantage to this dog food is the protein source isn’t very varied, and variety is crucial to your puppy getting all the amino acids it needs. Although the protein source isn’t varied, the primary carbohydrate sources, whole grain ground corn and wheat flour, make up for it. See, both ingredients are an excellent source of highly digestible nutrients. These carbohydrates provided by this dog food will give your puppy energy needed for their daily activities Also, this dog food contains ingredients that provide fibers such as dried beet pulp. As you know, fiber helps in digestion. Due to this, your puppy won’t have constipation. Equally as crucial as providing fiber, there are a lot of sources of fat in this dog food. For example, a significant component of this dog food is chicken fat. Fat sources such as chicken fat provide a concentrated amount of energy to your dog. This energy will be used by your puppy while it’s growing. Also, fats help in the transport of vitamins. Additionally, salmon oil is the primary source of fatty acids in this dog food. These fatty acids will benefit your puppy by helping in the growth of the brain. Also, the development of the eyes will benefit from the fatty acids. Furthermore, salmon oil, fish meal, and flaxseed are sources of omega 3 and omega 6 fatty acids to help your puppy’s skin/coat. The primary protein source in this dog food is lamb meal. While lamb meal is not also very digestible, the chicken meal inside this dog food is a very digestible protein source. But as we know, chicken is a common cause of allergies. So, make sure your aware of this before feeding this food to your puppy. Additionally, brewers dried yeast is another common cause of allergies found in this food. Therefore, this dog food contains two ingredients that are common allergens. Besides being varied in its protein sources, this dog food is varied in its use of natural grains. For example, significant components of this dog food are grain such as oatmeal, ground brown rice, dehulled barley, and rice. All of these grains are a good source of nutrients. In being so, the primary nutrient that grains provide is carbohydrate. These carbohydrates are an excellent source of energy. In fact, energy from carbohydrates is more readily available to your dog than energy from fat and protein. After all, your puppy needs a lot of energy growing up. Therefore, the variety of carbohydrate sources is excellent for your puppy. As you know, fiber is essential for your puppy’s digestion. Since grains provide fiber, this dog food represents is incredible for your dog’s digestion. Another source of fiber in this dog food is tomato pomace. If you feed your large breed dog with this dog food, it will not have constipation. Your large breed dog can also utilize the energy from the fiber. In this dog food, there are several sources of fats and fatty acids. For example, chicken fat is an excellent source of fat that will provide your puppy with enough energy. Also, the fats will help in the transport of vitamins. Equally as important, flaxseed and salmon oil are sources of fatty acid in this dog food. These fatty acids are essential for brain and eye development. Therefore, this dog food will help your dog grow up healthy. Your growing puppy needs to have a good number of good bacteria in its gut. These good bacteria called probiotics which are prevalent in this dog food. The probiotics in this dog food are dried enterococcus faecium fermentation product, dried bacillus licheniformis fermentation product, dried bacillus subtilis fermentation product, dried aspergillus oryzae fermentation product, dried trichoderma reesei fermentation product, dried rhizopus oryzae fermentation product, dried lactobacillus acidophilus fermentation product, dried Lactobacillus casei fermentation product. Along the same lines, prebiotics can stimulate the growth of good bacteria. Good bacteria population prevents the growth of harmful bacteria and the occurrence of diseases in your puppy. Also, good bacteria aid in digestion. This dog food has other beneficial ingredients such as rosemary extract, green tea extract, and spearmint extract to help your puppy fight diseases. In some cases, puppies can develop allergies and most of the time food causes them. As you would expect, some ingredients can cause allergies more than other ingredients. For example, chicken, turkey, and brewers yeast are the most common food allergens. However, soybeans, corn, rice, barley, eggs, peas, milk, oatmeal, wheat, tomato pomace, and carrots can also cause allergies but not as often. The ingredients that cause least allergies in puppies are kelp, lamb, sorghum, pork, beef, white potato, rabbit, and venison. Amino Acids As a dog owner, you must understand that puppies need amino acids. With this in mind, it’s essential you know that the best source of amino acids is protein. Therefore, it’s crucial the proteins are highly digestible to ensure your dog gets the amino acids they need. Protein sources that are harder to digest would not provide the amino acids your puppy needs. Overall, protein is essential for the growth of puppies. If your large breed puppy eats dog food with a low amount of protein, it can cause them to become overweight. Likewise, excess protein would not increase the growth rate of your puppy. When buying dog food, it’s important to know the primary protein source. For example, wheat gluten is one of the most digestible protein sources. Also, you should consider how digestible the protein is to ensure your dog’s stomach doesn’t start having issues. In this context, among protein source from animals, calamari has the highest amino acid digestibility followed by pork. Lamb and venison have the lowest digestibility. Chicken and other poultry protein source have moderate digestibility. Carbohydrates In your search for the perfect puppy food, a significant ingredient you have to consider is the energy source and fiber. See, grains provide highly digestible carbohydrates, proteins, and vitamins. However, there are different types of fiber; some are easy to digest, and some aren’t. After all, you need highly-digestible fiber to help your dog avoid digestive issues such as constipation. Fats And Fatty Acid Fats are an essential component of your puppy’s food. Without fats, your puppy would have less energy. Also, fats help in the transport of vitamins. Along with fats, your puppy needs fatty acids to develop its nervous system. These fatty acids aid in the development of the brain and other vital organs. For large breed puppies, the most critical consideration in their food is energy and the mineral calcium. See, large breed puppies grow fast, and this can stress their bones. If you feed your puppy more than it needs, it will become overweight but also have abnormal bones. Plus, excessive calcium fed to your large breed puppy causes nutrients such as zinc to absorb less. If you feed your large breed puppy little calcium, your large breed puppy will have hormone problems. Similarly, it’s essential to consider if the dog food you’re feeding your large breed puppy is designed with growth in mind. As you would expect, maintaining an adult dog’s health is different from supporting a puppy’s growth. Due to this, adult dog food available in the market should not be fed to your large breed puppy because it exceeds the recommended amount of calcium and calories for your growing puppy. Generally, dog food marketed for puppies of all sizes contain the right amount of calcium for your large breed puppy. These dog foods provide fewer calories so that your large breed puppy is not overfed and won’t become overweight.